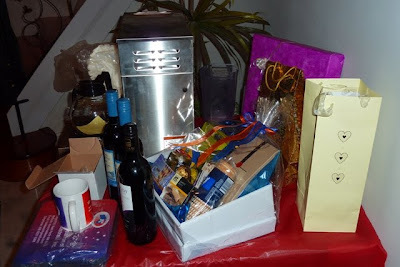 Members donated many goodies for raffling during the night. Raffle tickets were sold at a very affordable $2 each to ensure the maximum number of members being able to participate and try their luck. 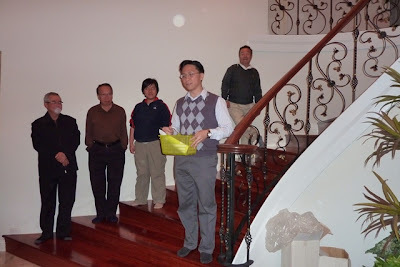 All prizes were donated by members, and the HakkaWA Charity Fund benefited with $338 being added to the existing fund raised from last year's Mothers day Gathering at Tina Wong & Johnny Yong's house. 1. Our Honorary Advisor Mr. Francis Yapp donated a bottle of brandy. 2. 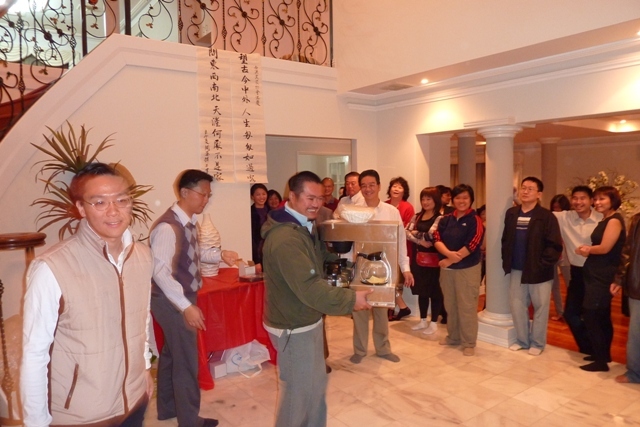 Vice President Mr. Ben VB Soon donated a big good coffee maker. 3. Committee member Tina Wong donated 2 bottles of wine. 4. Hannes Chang and family donated 2 flower vases. 5. Mrs Lily Kong-Yit donated 3 mystery packages as prizes. 6. 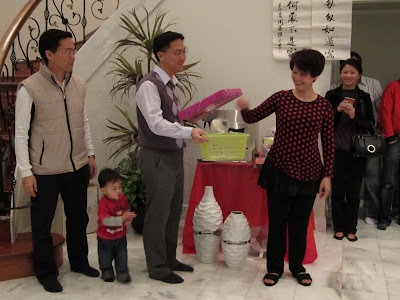 Datin Lilly Yong donated a hamper of goodies. 7. Mr. Dominique Siew Tu donated mugs and many mouse pads printed with "Hakka Association of Western Australia Inc."and our logo. 8. Jonas Yong & Keith Yong contributed a bottle of wine each, on behalf of Lex Legal. Honorary Advisor Mr. Francis Yapp drew the number for the prize of a premium bottle of brandy which he donated. Jonas Yong calls out for the winner to come forward, while raffles organiser Keith Yong holds the basket of butts waiting to be drawn. Chia Shui Chong and Louise Vun look on. Honorary Advisor Mr. James Chong did us the honour of drawing a prize. 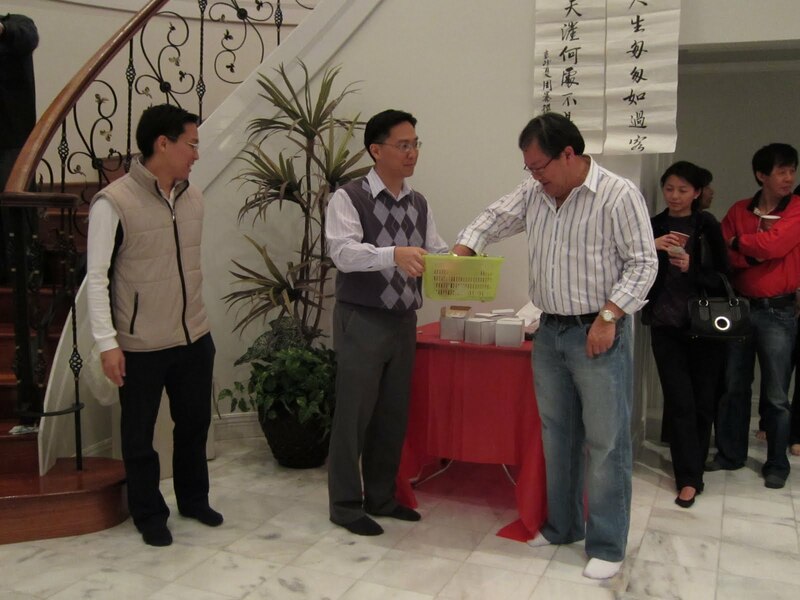 Members contributed generously by purchasing raffle tickets. 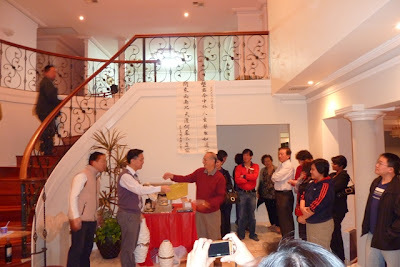 Raffle organiser and Vice President Keith Yong gave the welcoming speech and announced the rules of the raffling, while Honorary Advisor Mr. Francis Yapp, Committee Member Zhou Mi, Angela Han and Associate member Robert Chai listened on. Simon Chai, son of Associate member Robert Chai, carried away with the big prize, a coffeee maker donated by Vice President VB Soon. Who hope Robert would now become a financial member, Simon to join our Association, soon. 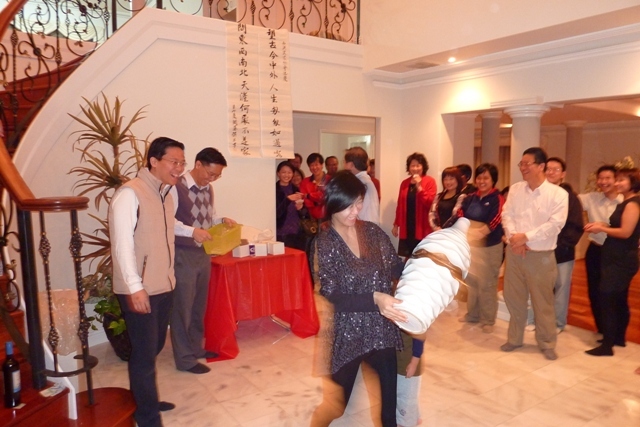 Another lucky member carried away the bigger vase donated by Hannes Chang. 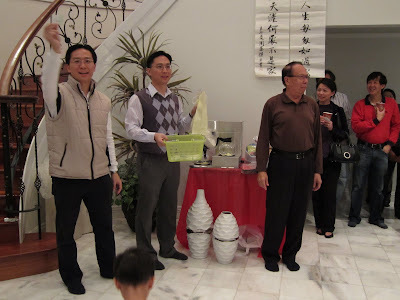 The vase was actually drawn to Dr. Jeff Tee but the generous Dr. donated it back for redraw. Our host and Committee Member Mrs. Lily Kong-Yit drew the 3 winning tickets for the 3 prizes or mystery packages she generously donated. Little Jayden Chan also wanted to join in the fun. Dominique Siew Tu, our member who haild all the way from Mauritius, drew a few winning tickets for the mugs and mouse pads printed with HakkaWA logo and name.